The newest generation version 4.7 Quantum Magnetic Health Analyzer produces up to 47 health reports for analysis. An emerging rapid, accurate and non-invasive spectral testing method, particularly suitable for comparison of curative effects of medicine and health products, and checking of sub-health conditions. Click highlighted links for individual health report sample. Whatever conventional testing method used, blood analysis or radiography, may take one, two, or as long as three weeks to get results. This can create depression and additional anxiety in anticipating the unknown. 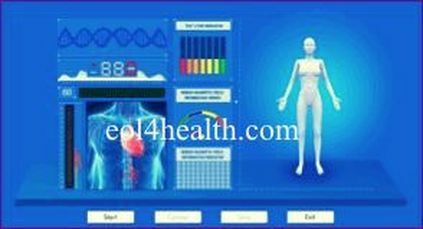 The hi-tech Bio-Electric Magnetic Health Analyzer scans the body and will produce health reports in just 2 minutes.